The Big Sur is probably one of the most famous drives in the world and deservedly so. It is simply spectacular. We set off from Monterey on Saturday morning with San Simeon, the first town at the end of the drive, as our destination. We were lucky with the weather as the sea mist had threatened to obscure the coast, but the check out guy at Trader Joes had promised us good weather for our drive. He kept his promise. We started our journey via Pacific Grove driving past Cannery Row on the way. If you ever visit Monterey, I recommend that you stay around here or Pacific Grove as it there is so much more to see and do here, than in Monterey itself. The coast here is stunning. All the houses and trees have been bleached by the sun and sea water, the light is fantastic. I just wished we had more time so that I could go sit on the beach, listening to the sea, with a good book to accompany me. The previous day we had done the 17 Mile Drive and visited Carmel where houses start at around 4 million dollars. It was all very beautiful but somehow it was as if the rich had tried to tame this wild coast so they could wear their designer clothes and high heels, whereas the cost demanded shorts, sturdy shoes and a warm jacket. Surf board optional. So, The Big Sur! It is 90 miles from Carmel to San Simeon, yet you need to allow 4 hours to drive it, because it hugs the coast and you just have to stop at almost every Vista Point to, well admire the vista! It was a Saturday so we were accompanied on the journey by charity car clubs and Harley Davidsons, all there for the ride of their life. At one stop we passed a peaceful protest linked to the Occupy protests in many cities, with a live rock band playing, protesters waving the American flag, placard proclaiming ‘stop corrupt greed’ in another there was a string quartet playing, but mostly each laybye was another photo opportunity and a chance to be amazed by the scenery. We had planned to stop for lunch at Nepenthe but so had everyone else on the road so gave the best burger on the Big Sur a miss and stopped instead at Cafe del Moro above a gallery featuring works by Henry Miller. There was a choice of panini or panini for lunch, so we shared a 10 dollar toasted sandwich. The views were great though. It was a day that the Lotus and Ferrari drivers came out to play and the cafes balcony was a good place to watch them, I almost thought I might see Jeremy Clarkson in a Prius , James May in a camper and Richard Hammond in a Smart Car. We made another stop at Lucia Lodge a hotel in such a spectacular setting and one, if I ever have the good fortune to do this drive again, I would try and stay at. We lingered over tea, debated with the staff and other guests as to whether it was a fox or a bob cat we had glimpsed below and met Martin and Sandy, from Germany, who were asking for advice for somewhere to stay that night. 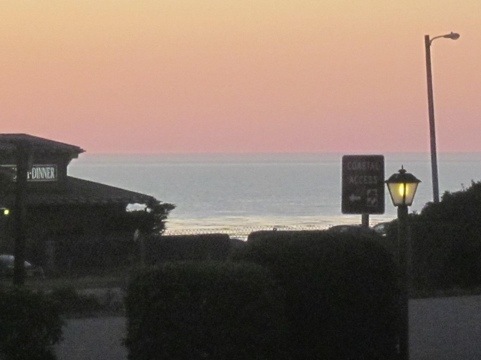 Six hour after leaving Carmel we left the Big Sur in search of our lodgings in San Simeon. We had glimpses of Hearst Castle towering above us, bathed in the last sun of the day. We followed the signs to San Simeon, found a beach and a wharf but no hotels. Back on the highway our new friends had sat nav and a phone so they tried to locate the hotel, we carried on along CA1 and then we saw not one but dozens of motels, lined up along the highway waiting to capture weary Big Sur survivors. 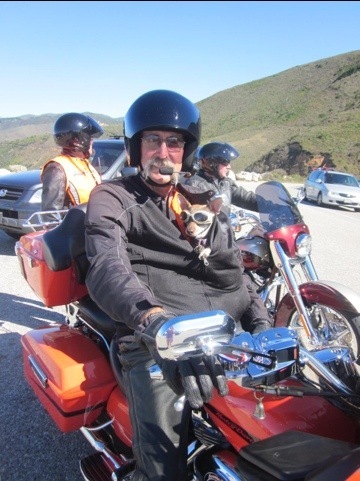 This entry was posted in Travel, USA and tagged Big Sur, California, Harley Davidson, Hearst Castle, Top Gear, United States by Travelling Coral. Bookmark the permalink. Looks like everything you’d hoped it would be:) ONWARDS!